by a draft on a U.S. bank. Price 25 cents per copy, $1.25 per year. F'our th quarter. . . ... .
Third quarter . ...... .. .
-iRepresents uninsulated, bare tinned, anid/or alloy coated wire. Rod, bar and wire . F lakt ........... .... .........1 (/) 1. (7) Is . ; lihanl (O0,lO [ poi, nds. Exports domest ic Percent Imports for Percent. rRevised by 5 percent or more from previously published figure. (Z) Less than half the stated unit of measure. IComparison of domestic manufacturers' shipments, export, and import codes for copper-base mill products appears in table 4. 2Source: Bureau of the Census Report FT-410, U.S. Exports, Commodity by Country. 3Source: Bureau of the Census Report IM 146, U.S. Imports for Consumption and General Imports. 'Apparent consumption is derived by subtracting exports from the total of net shipments plus imports. 'This total does not include either insulated wire and cable products or brass bronze foundry products. IThe import and export codes for this line do not include wire. previously made as described above and other corrections. wh. intermediaries (wholesalers, exporters, etc.) are involved. 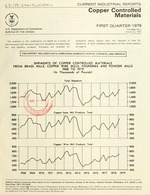 An Annual Current Industrial Report is published in this series. 7. "Telephone Contacts for Data Users"
population, manufacturing, housing construction, retail and wholesale trade, services and governments. Data User News helps you keep track of developments that may be important to you. DATA USER NEWS AT $4.00 PER YEAR.